Welcome to our English School! We are a non-governmental initiative founded by Mr. Chhoeun Rith and sponsored by Project Cambodia, an Australian organisation founded by Leon Pope. Together we utilise humanity and cultural curiosity in everyday travellers, and offer them a local insight in exchange for their time two hours per day to teach English to our students. Volunteers wishing to spend more time teaching, we are happy to make arrangements with the public school, to see where you’re able to assist. No experience is required, just passion and enthusiasm! Mr. Rith has opened his home located in Ouressey Village outside Kratie Town, to support local children to learn English, which is not taught in the public school curriculum. Our mission is to support the young community by teaching English, which is vastly becoming important throughout Cambodia. Learning from volunteers from all over the world gives the children a comprehensive understanding of the English language from a multitude of perspectives. We believe this understanding will give a far better chance of sustainable employment away from the streets, and provide opportunities on not only a national scale, but also a global scale. The English School currently supports fifty children aged 7-16 years old. Our newest project over the past year has been including the young monks from the local monastery and pagoda into our mission. We teach around 60 Monks in total, which are split into intermediate and basic classes. For many of our students, our school has given these children their first opportunity to learn English, and we’re very proud of how far they’ve come. We teach the Monks out of the local pagoda, which is a three minute walk away from our school. The rest of the classes are taught straight out of our school classrooms. In February 2018, Leon and the team from Project Cambodia funded the construction of three new classrooms for our students, as well as a new lesson planning space for our volunteers. Project Cambodia have become more involved in the school to ensure the students are reaching their full potential, and volunteers are gaining an authentic insight, as well as having some fun! We do implement a dress code when you are teaching the monks. We ask that shoulders always be covered, and long pants or skirts be worn to be respectful. Buddhist tradition also restricts women from making any physical contact with our monks. We appreciate your understanding. Our volunteers staying onsite at the school are asked to make a $5USD contribution towards their meals and accommodation each day. A minimum stay of two weeks is also recommended to ensure the children remain engaged and get to know your teaching strategies. The English School is located in a very local village outside Kratie town. Here you will receive a very authentic insight into local life and become familiar with Mr. Rith, his wife and two children. Mr Rith's wife keeps you full each day with genuine Khmer foods. "Teaching the monks is a truly unique experience which you will not find in many places. They are so eager to learn and such polite young men it really is a pleasure to teach them, especially knowing that this is the only opportunity they will have to learn English as many of them have no parents or are from poor families who can't afford private tuition. Our school gives the volunteers the opportunity to direct the course of their classes. We have many teaching materials for you to use. Many of our volunteers leave grateful for their lessons in initiative, confidence and strength in themselves. This experience truly is one of a kind, where it teaches personal lessons, as well as genuine insights into Cambodian life. In your time here, our volunteers become a part of our community. The village is a beautiful place to live, the rural lifestyle is amazing, strolling to the market for fruit and having all the children waving and saying hello is lovely. There is a real sense of belonging here. In exchange for low-cost accomodation and meals, we ask for for 2 hours a day of lessons, and prior preparation for lesson plans. Our friends from Project Cambodia have given us the necessary materials to communicate and log each of your lessons to ensure we are constantly moving the children forward with their learning. There are many other activities to help with throughout the school, including keeping the grounds tidy, staying on top of organisation, answering emails. We supply basic accomodation, with mosquito nets and double beds. We ask for a $5USD contribution to put towards your meals each day. - There are several places you can visit here in Kratie. There is a club located half a kilometre away, where there are facilities which include a swimming pool, gym, and areas for football and volleyball You can visit Koh Trong Island by ferry for1000riel ($0.25USD) or 3000riel with bicycle ($0.75USD). There is a 9km track around the island, perfect for a sunset bike ride, or walk. Bicycles cost $1USD per day, and motorbikes cost $6USD per day. - Each day we are blessed with beautiful sunsets over the riverfront. - There are many kayaking and boat outlets where you can visit the flooded forests and endangered irrawaddy dolphins along the Mekong River. - There are also many other tourist activities in town to keep you busy in your spare time, including religious sights, monkeys and plenty of countryside to visit. - Our School is well known around town, upon arriving at the bus station, simply instruct your tuk tuk driver you’d like to come to the English School and they will bring you to us. This will cost $2-$3USD. Ravindra has been a very good volunteer, my family enjoyed his time spent at home. The kids and monks loved him and learnt a lot. Easygoing and hard worker, I would definitely recommend ! João and Fabiana stayed at the school for 2 weeks, and their company was great! 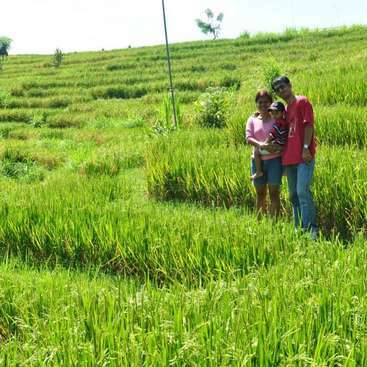 They are a lovely couple that work great with children and building activities. They broght us a lot of donations (books, materials for the children, clothes, toys) the kids loved it! They helped the kids and the monks with so much care during classes. They also… read more painted the whole school, changing the atmosphere for the children. We are sure their work changed the school and had a positive impact in the lives of our children. Thank you for your help and hope to see you back soon! We stayed at Mr. Rith's house for 15 days and it was an amazing experience. The accommodation was good, we had one room for ourselves and the bed had mosquitoes net (which helped a lot). The food was really good, Mrs. Rith is a very good cook, and we had the opportunity to eat genuine Khmer food. The neighborhood is also very nice, we made some… read more friends there who also helped us a lot. The experience to teach the monks was amazing. They are very smart and focused during the classes. We surely learned more from them than they learned from us. We also had the opportunity to pray with them and learn about their lifestyle during the nights in the Pagoda. The kids were so adorable, we miss them already. To have the chance to teach a group with different personalities was a special experience. We also had time to clean, paint, redecorate and renovate the classrooms and the deposit of the school. We would love to be back years from now, to see the kids, the monks and the school again. Thanks again for the opportunity Mr. Rith! Having Daniela and Diogo stay and volunteer with us was great! They are outgoing, motivated, and easy to get along with, always making our students feel comfortable and ensuring they were learning new things. We would happily have them back and recommend them to other hosts searching for people who are hard working with great people skills. We stayed one week at Mr's Rith house and it was truly a great experience! Mr. Rith is a very kind person and was always asking if everything was ok with our stay at his house. The same can be said about his wife and two kids who are very charming. The school is 2km away from the center of Kratie but is very easily accessible by Tuk Tuk (every… read more driver on the city knows the address of the school. Our sleeping accommodations were very good (we had a room just for ourselves, with a bed and mosquito net) and the food was great. Some of the best local dishes that we had in Cambodia were cooked by Mr. Rith and his wife. The workload is very light, but interesting. We had one class between 13h and 14h at the Pagoda with the monks and a class between 17h and 18h with young kids at Mr. Rith's place (there are three classrooms behind his house). The classes with the monks were always the highlight of our day, they have a lot of sense of humour and they are very polite, it was always a pleasure teaching them. The class with the younger kids was also fun, but they do have a lot of energy so it is very important to have the help of other volunteers to divide the class in at least three parts so that it is easier to manage the kids. If you are interested in having an English teaching experience and you also want to see how's life at a small Cambodian village, we really recommend this workaway. We will miss Kratie. I spent an amazing week in Kratie at Mr Rith’s house. 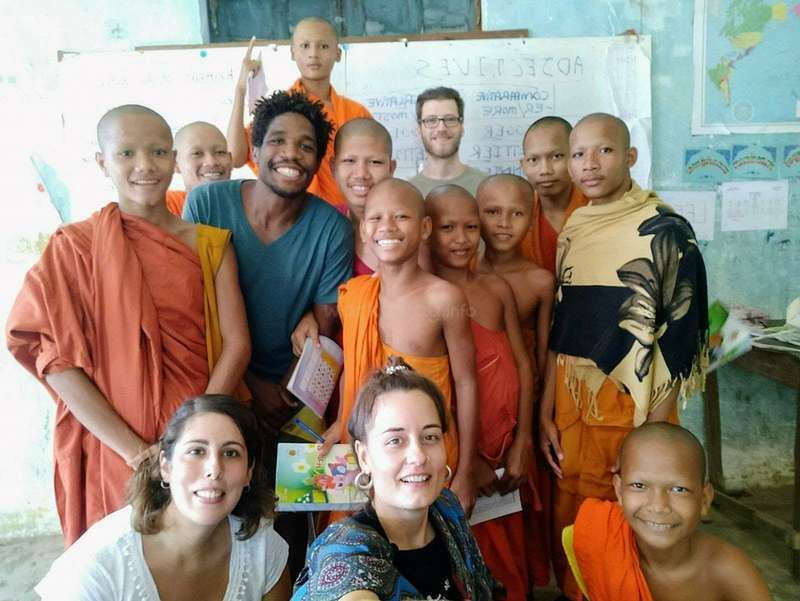 Teaching English to the local kids and monks was an incredible experience. 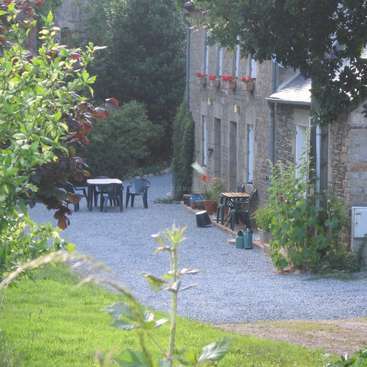 The accommodation was clean and comfortable and we received 3 delicious meals per day. There is a hotel nearby where we could rent bicycles and explore the neighborhood also could use the swimming pool for free. We had… read more one class from 1pm to 2pm with the monks and from 5pm to 6pm with the kids. Usually we prepared everything for the classes early morning or late night and we had a lot of free time to go for kayaking and watching the river dolphins, relaxing at the pool, visiting pagodas and a meditation center nearby. I would absolutely recommend it! Andrea and Ramon stayed at the school for two weeks and the kids already miss them! They painted a really nice world map on the wall and helped me to manage social media and workaway. They are full of energy and always open to help. I would recommend them to any host. We stayed with my partner volunteering at the School for two weeks and the overall experience was great. Where to start... well teaching the kids and the monks is such an amazing experience. They are full of energy and always willing to learn more and more. The monks are so polite and it is incredible how disciplinated and lovely they are… read more teaching them is a unique experience. The accommodation is basic but enough. You will live with Mr. Rith’s family. His wife cook for you Khmer food and she is lovely. However, the project is a bit unattended. There isn’t a proper methodology or curriculum to follow which make it hard not only for the volunteers but also for the kids. That also turns into so many different levels in the class. That and the lack of volunteers does not help to the kids improvement. This project really needs someone to take care of it either staying for a long period of time or just by managing the workaway and social media. A better management on it would turn into something really positive for all those kids. We hope to come back in the future and see how it has improve. And of course help again! Thank you Mr. Rith and family for letting us be part of the project. I stayed two weeks with Mr Rith and his family. The hospitality was amazing! The food and the help and just the whole atmosphere made me feel at home. The project itself is a really unique experience, especially to teach the monks who are so kind and lovable. To know where to start with teaching might be a bit difficult at the beginning as there… read more is nobody around who can tell you what to do but this also gives you a lot of freedom to plan the classes with your own creativity where you can also improve and challenge yourself. I just want to highly recommend to volunteer at thisplace as help is needed a lot and to support this project as it is doing great work! Thank you so much for everything i really hope to see you again! I stayed two weeks in the project and it was hard to go. I found a great group of volunteers that helped so much in organizing the classes. The curriculum for the classes has not been designed jet so there is a need of extra energy for organizing the classes according to levels and knowledge. But everything is worthy when you see how the kids… read more achieve new goals day by day. Their motivation and energy will fill you with happiness. The accomodation and meals were correct and the family is so helpfull in any need you ask them for. The village is small but with all you need. Hope to be back one day and feeling so proud again of this kids efforts for having a better education. We stayed for 5 days together. These days were very pleasant and impressive. We was studying and swimming in the river with monks, was playing games. We exchanged experiences and becames friends. Thank you very much! That was a great experience! Maxime has been a very good volunteer, my family enjoyed his time spent at home, the classes went well, the kids and the monks loved him and he even helped in the building of the new school. Easygoing and hard worker, I would definitely recommend ! I don't know where to start : the experience with the kids and the young monks is life changing, Mr Rith and is family are lovely, the bedrooms are comfortable, the house is mordern and the food delicious. I would definitely recommand if you have some spare time in Cambodia, if not I'm sure you can find some ! The kids deserve and want to learn,… read more please support this project and help Mr Rith. Lore is a good volunteer, involved in the project all the time, easy going and pleasant to work with. I have been in the school about 12 days and it's been one of the highlights of Cambodia, no doubt. Mr. Rith and his family are simply amazing and make you feel welcomed since the first moment, the food provided is so good and their kids are fun and playful. Also accomodation in the house and the private bedrooms are really great! The teaching… read more experience is really fun too, I didn't know what to expect about teaching monks but they are lovely kids that just want to have fun, but in the same time they are eager to learn english. They will help you in all they can to make your class easier to teach, and they help each other following the lesson too. The class of the afternoon with local kids is also fun, and Mr. Rith's son is a student in this class, which is great because his english level is good and this makes everything easier. This is a lovely project that I would love to see growing next years, I highly recommend anyone to join it!! I stayed 1 week with Mr Rith and his lovely family. They made me very welcome, the room is comfortable with mosquito net. There were a few volunteers when I was there, and we joined in the Chinese New year celebrations. The food was delicious and very varied. The teaching was a lot of fun, we taught in the pagoda as a new school is being built. It… read more was amazing to get to know the monks, they have little but seem so happy. I would definitely recommend this place, its a wonderful school, and it's very near Kratie so can go out to see local attractions. Was really nice to be there!!!! I spend a week at the English School and had a great time with really nice people!!! On weekdays, there are two classes, in the afternoon we went to the Pagoda to work with the Monks and in the evening the kids at School. The level is not so high so you can help in many ways. 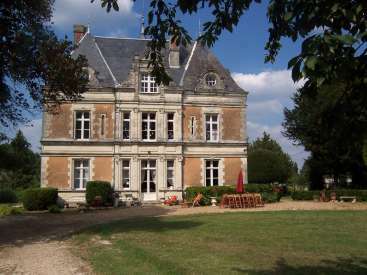 Accommodation and food are fine, there… read more are many rooms so will have some privacy. We spent two weeks here in June 2017 and really loved it! The kids and monks are so great and although you get a few naughty ones they are mostly well behaved! One issue is getting them settled and to listen in class, worksheets work best! Teaching the monks was especially good and their head monk was so lovely and even gave us fruit to say thank… read more you. Mr Rith and his family as very welcoming and friendly, he gave us a nice tour of the village on our first day. We took the kids to play football and go swimming on the Sunday which they loved! The only negative I would say is the lack of orgnaisation, Mr Rith is not involved in classes at all so it's completely run by volunteers. When we arrived there were books and papers everywhere and nothing was organised into folders at all. We spent a whole day organising it all so I really hope it stays that way for future volunteers as it was a nightmare! The other issue is the lack of feedback from volunteers on what has been taught. It was really hard to know where the classes were in terms of ability because of this. In general it is really good place to stay here. It really needs help from volunteers because there are so many kids and not enough teachers. PS Wi-fi is not good, unfortunately. PS1 Food is very very good! This was my first workaway experience and it was awesome! It was one of the best experiences in my trip, teaching english for the little monks. Everybody in the pagoda are really lovely and helpful! Mr Rith helped us to fell the Cambodian culture, we were invited to a wedding, a birthday party, went to celebrate new years in the pagoda. Was… read more amazing!! I just think Mr Rith should involved a little bit more in the classes, because if there is no volunteer at some point, even with the notes that the other volunteer leaves, some progress could be lost. Except of this, thank you so much for everything!! It was a great experience!!! This was my first workaway experience, absolutely loved it! especially teaching the monk's. Thanks Mr.Rith and family for your hospitality and making me familiarise with Cambodian culture. Cheers!! Thanks Mr. Rith for let us have a good time at his place. 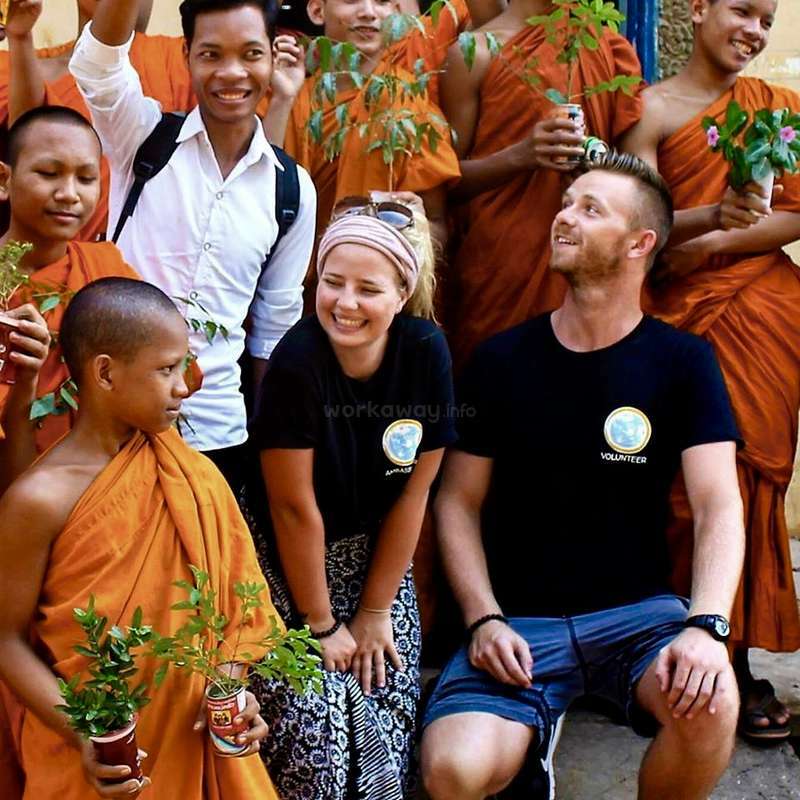 This is a good volunteer experience because you have the opportunity to live in a village out of the tourist beaten track, and teach kids, specially the young monks which don’t have the opportunity to study with their own families. Just for this it’s worth to work here. Although,… read more because this project it’s totally run by volunteers, it lacks management and organization since the volunteers stay there for short term and is needed somebody to follow up the kids progression and development, and also somebody who can speak Khmer to help specially the younger students. We had the opportunity to meet great volunteers there, with great souls, which tried to find solutions to this lack of follow up on the kids development in long term. For that, we think volunteers deserve better conditions on accommodation and food. We would like to thanks Mr. Rith for not charging us the first night since we arrived in the evening and for let us use his kitchen for cooking! We had a good time here and we hope the implementations we’ve made have success. I had a truly wonderful experience here, away from the beaten tourist track. The kids are just incredible, and you will want to work so hard to make them happy and learning. 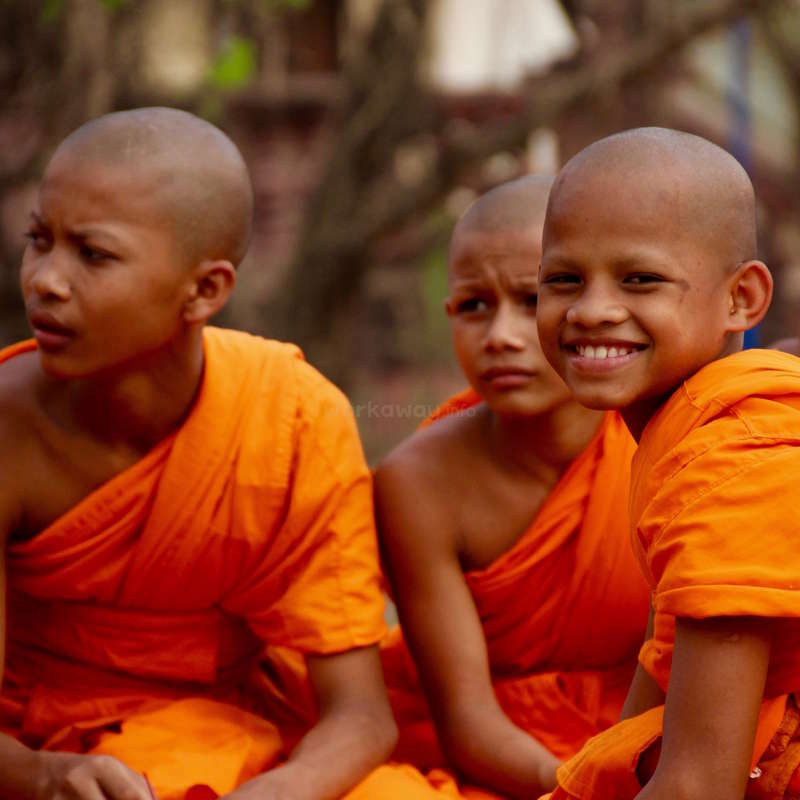 You can get to know the leader monk and really absorb cambodian culture (we even went to a khmer wedding), and for this and the joy of teaching the kids the 5 dollars per day… read more for food and board is some of the best money I have ever spent. I will be back again before leaving Cambodia! Orkun Mr Rith. Thank you for teaching me so much Khmer, and for opening your doors to me. Chumbrit li! This was my first Workaway experience and it couldn't have been better. I planned to stay there for a week but ended up staying almost 20 days! I loved teaching the kids, specially the monks, who are the cutest little men ever! There are two different levels: basic and intermediate. I taught in the basic level, which is really really basic.… read more Sometimes it is hard to plan the lessons as there is no specific curriculum and there are many volunteers coming and going, but we all figured out the best way to teach the kids and it always worked. The other volunteers were very motivated and full of ideas, so it was easy to work with them, as a team. Besides, Mr. Rith helps you in anything you need. His has a beautiful family an his wife is such a good cook! Thank you very much Mr. Rith for everything! Thank you Mr. Rith for the two weeks we could stay with you and your lovely family. May you ever be healthy and live in peace. Between the lessons we often went to the nearby sports ground or the pool at the river dolphin hotel. The local kids joint us playing football or volleyball. One weekend we took all the kids from school and played with them football. Furthermore we visited the pool next to the sportsground. It is a nice experience to see them outside of school and we all really enjoyed the hours we spend there together. To all the coming volunteers, take a closer look at this place. You will not be dissapointed. It was hard to leave the place after two weeks. Of course not everything works perfect. It is hard with shorttime volunteers to create a curriculum and some material like sets of books of all levels would be fine for future. Mr. Rith has an open ear and if you have suggestions feel free to tell him. We are sure he will do his best to understand the needs for the project. It was great to stay at Kratie with Mr. Rith and his lovely family. From the incredibly welcoming atmosphere to actually engaging work, everything was truly fantastic. It was a worthy experience, and I would recommend it to anyone who wants to help Cambodian youth. What an experience! I will never forget those 10 days spent here. We had the opportunity to teach english to kids and to monks in the pagoda, and we received so much smiles and love in return. The accomodation is good, if you need something Mr Rith will make everything to please you. The food is fresh and good, we discovered little cook treasures… read more here! 5 dollars accomodation and food per day is really cheap. The work was not hard because we did it for the kids and it was mainly finding new ways to make them learn by games(for the basic class). For the intermediate course, you will have to create more than just games but you can easily make it. The volunteers we met helped us a lot by giving us advice and showing us the way. Don't worry if you have no previous experience in teaching. Just speak english but I'm sure you already do. We also tasted the local life in Kratie, like a little Cambodia festival or the wedding which was fun. Definitely, if you wish to go, don't hesitate. I've been really moved by those people. Mr Rith's project is a super initiative. He does it for his community, he is a man with a big heart. Some children can't afford public school so they come by Mr Rith school. There are plenty of things to do to improve the already existing school, but if you can just give your time and your energy, you can make a big difference for those kids. For me, I may come back one day. I really loved my time with Rith and his family. We had to teach around 2.5 hours a day and the rest of the time we could prepare our lessons and relax or go into town. The kids you will be teaching are reay lovely and enthousiastic. I had so much fun with them. 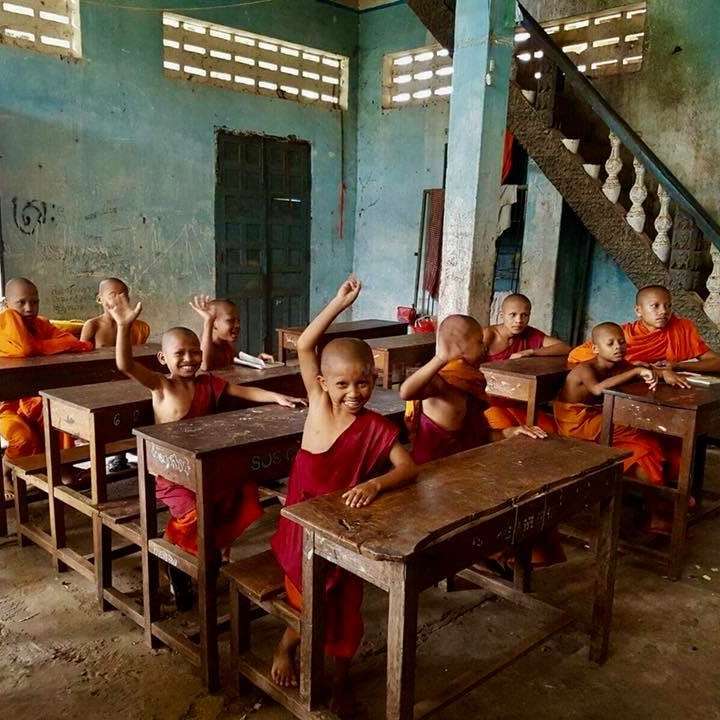 I would recommend everyone to visit the school cause it is an amazong experience as… read more you even get the chance to teach monks, which are just cute little boys. Hello Arkadiusz thank you for your volunteering at my school with your trying to teach students. This is an amazing place for the children and Rith with his family are very nice people. They will help you with everything. Plus food here is really good. We had a great week, Mr Rith and his family are so accommodating and welcoming. The home cooked meals by Mr Riths wife were delicious! 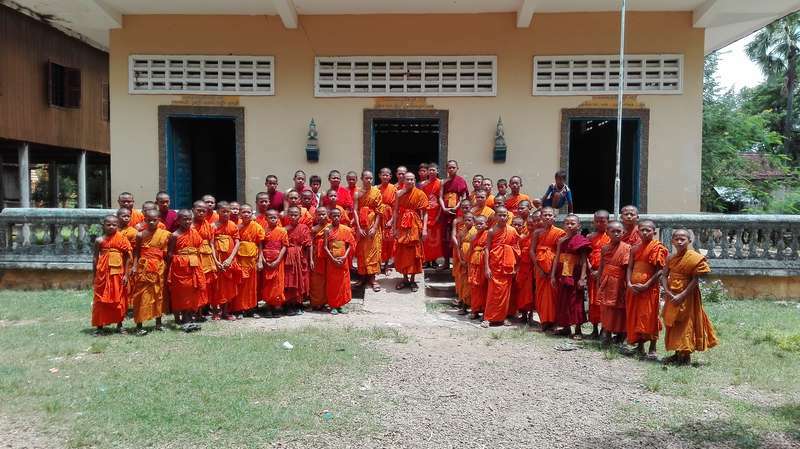 We had the opportunity to teach the children at the school and the monks at the pagoda and it was lots of fun, the monks especially are very enthusiastic and eager to learn. We had plenty of time to explore… read more Kratie, Koh Trong island and Kampi where we saw the river dolphins, an amazing experience. Thank you Mr Rith for a great Workaway experience! We are happy and thank you so much for Your teaching English and your donation at my school. We hope that meet you again one day. I wish you good luck and good trip for your traveling. This letter is to confirm that Markus Merkt volunteered with us in Cambodia from 28-October- 2015 until 11-November-2015 with our volunteer for English instructors. Markus volunteered at our English teaching program in the small village of kratie, which I founded due to the need for Cambodian in the region to learn English from… read more fluent speakers. The English School is the only program in our town that offers free lessons from fluent English speakers, and has been hosted at my home since September 2015. Our mission aims to motivate both children and adults alike to improve their English skills, so that they can be successful in fields where the khmer language is not accommodated. We offer courses based on the student 's English ability, as well as night courses for adults. While working with us in kratie,Markus worked together with the other teachers to create English lessons each day. Markus spent his time the students, assessing their individual comprehension of the daily material and assigning homework to be completed during the student's spare time. Markus taught 2 hour-long Intermediate classes each day, providing interactive lessons, reading assignments,and encouraged the students to talk to each other in English to practice the new concepts. On weekends,Markus and the other volunteers pooled personal resources together to fund football and swimming days with the children at the local recreation center. 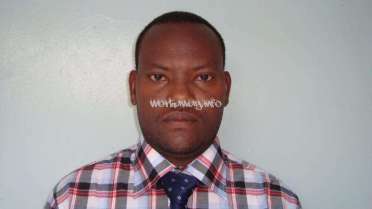 His efforts contributed to the growth of our school,which was still in its developing stages during his stay. We wish Markus well in his future ventures,and hope he will continue to use the strong commitment and passions he had with us at the school. If you have any questions about our English projects,feel free to contact us. very sorry for the late late feedback - fortunatly here we are! I have to das it is a wonderfull project and i'm so glad that i had the opportunity to be part of this amazing project. Mr. Rith and his lovely family have been very carefully to me and got me all i needed. The food was very good and a lot. The family is passionated to… read more teach disadvantaged kids and gives the opportunity to learn english - thats the goal of the family. The kids really want to learn english and they are greatful and appreciate what we do. It is definetly more than rewarding. We would like to thank Rith and his wonderful family for making us feel welcome in their home. We had a great time living with them for 10 days, and enjoyed great food, along with chats with Rith and playing with Tola and Vita. The school works well on limited resources, and it is nice to see that Rith has devoted his time and home to helping… read more the children learn English. Though the school lacks a little structure, I think that this will come in time with dedicated volunteers who listen to the children and take note of what they want to learn. We wish Rith and the children all the best for the future! I really appreciate time spent in Mr Rith's school. The village is so nice, adorable kids. mr. Rith is a kind person. During the day time to teach is short, so there is time to go around the city (Kratie), go to the swimming pool near the school. and in the weekend explore beautiful places near there. Thanks Mr Rith and his wife for… read more hospitality. I was only able to stay at the school for four days because my time in Cambodia has become very short, but I had a really wonderful experience at the school and hope that I have the opportunity to return one day! Teaching is only a few hours a day, which gives you lots of spare time to explore Kratie, hang out with other volunteers or swim in… read more the pool at the hotel. The kids mostly have an extremely basic level of English, so it can be hard to communicate and explain to them without someone who can translate to Khmer. However, they are all eager to learn and very very adorable. I can't wait to see how the school develops with more volunteer participation and funding. Anders stayed at our school for some time and he was an outstanding volunteer. I recommend him as a volunteer to everybody. Anders- thank you very much and good luck for your future! I stayed with Rith and his family at the school for three week and had an great time. Rith and his family where very friendly. The classes were good but the kids could be a bit challenging to handle sometimes. With that said i really enjoyed the experience of teaching and living in Kratie. Ingrid and Aric were fantastic volunteers the School. They were enthusiastic teachers, showing genuine care for all of their students, and constantly coming up with creative teaching ideas. They are very hard workers and great house guests. Thanks Aric for being our "maid." He was always cleaning! They also helped create a new organizational… read more system for us which was really helpful. Thank you for everything and happy travels! There are to much to do around, we had so much fun in our free time. Thank you Rith and family for you hospitality! Teaching in this School has been a very good experience for me. I arrived last minute and that was no problem, Rith and his family are lovely and very flexible, listening to you and immediately making you feel at ease. They provided us with everything we could wish for, the other volunteers were inspiring people, it seems to be the kind of place… read more that attracts this kind of people. The kids are cute and eager to learn, all very intelligent even tough there is a lot of teaching to be done. The classes need more structure to be efficient and I feel a curriculum would be very helpful! Be sure to spend at least one weekend there as visiting the island and taking the kids to the pool is a lot of good fun! Overall such a enriching experience and a true insight on northern Cambodian culture and rural living! Thank you Rith for hosting me and for giving this opportunity to the kids, I'm sure it will keep growing and create a lot of happiness! I really don't know how to rate or advise others concerning this workaway as it was simultaneously one of the best experiences I've had on this trip and one of the most frustrating. There are plenty of positives, from the food, accomodation, friendliness of Mr. Rith, family & friends, wonderful children, the atmosphere to the visits to the… read more river, temples, pool, etc. I was unfortunate enough to become ill during my stay, Rith accompanied me all the way back to Phnom Penh and made sure I was settled in the hospital there (hint: don't get sick!). Unfortunately there are also some significant negatives which may be, in part, due to cultural differences and/or the newness of the project. The most significant (and easiest to address) of these, from my perspective is the lack of participation/planning from Rith - The almost complete lack long term planning, a business plan, budget, accounts (and a regular Khmer speaker to help translate instructions, etc) makes everything much harder than it needs to be. example - we tourists are charged significantly more in shops or at the market, yet nobody was available (or wanted) to go shopping for supplies meaning our donations went half as far as they could have. Hopefully the long term volunteer teacher will be able to address the lack of planning and assessment, but this project (and the planned future schools) desperately need a bi-lingual assistant to make everything just that little bit easier for students and volunteers alike. I realise that sounds very negative but, on balance, I'd have to say my time there was positive and that, given the opportunity, I'd be happy to visit again to see how things have changed, the kids have progressed, etc. Thank you for everything and good luck for the future ! I stayed 2 weeks at the school and had a wonderful time. The school in Kratie is a new and growing project that needs all the help it can get. Teaching to the kids was a lot of fun. These kids are very lovable and motivated. Also, living conditions at Rith's house were excellent (food and accommodation). I would definitely recommend workawayers to… read more stop by in Kratie! We thank Rith for giving us the opportunity of volunteering and being part of his project. To see his 'growing' project and what he has already reached after three months is really adorable! The experience was amazing, the food was great, and the kids extremely lovable! Beside spending time with the kids there are also a lot of tours in and… read more around Kratie possible, guided by Rith. Thank you Rith and your wife Sopheavy and your lovely children! With warm regards to all from Sven and Bea! Wow, what an amazing project! I stayed for 3 weeks and could have stayed longer. Rith and his family are some of the kindest people I've met, and deserve all the help they can get! The school is still developing, and any help goes a long way. You really feel like you're at home here, the host family does everything they can to make sure you're… read more comfortable with them. I would love to go back one day to visit the kids, and see how far the school has come! We had a great time with Rith and the kids at his school. The accommodations where good and the food was great. He was very welcoming and made us feel at home. He made sure that we got out to see the town and all the great tourist activities around. I highly recommend the bike ride on the island! The kids are really wonderful and eager to… read more learn. While he does state "no experience necessary" I would highly recommend researching some evidence based teaching techniques and lesson plans for cambodian children prior. We were one week in Kratie and it was a really nice experience. Rith did a really great thing founding his shool, but he still needs all the help he can get! Besides teaching the children, we got a good impression of the life in cambodia. Rith took us to a typical karaoke-bar, some nice places around the town and to some of the families of the… read more children. We also want to mention the traditional and delicious food of his wife. Thank you for the wonderful time. once more, thank you very much for your amazing support at our school. He was a very good teacher with a lot of patience for the kids and he brought some school supplies like books for teaching the children. We hope to see him again here, he was a great volunteer. We all appreciate your work and wish you the best, hope youre doing… read more well. I just want to thank Rith and his family for the great experience and the hospitality. 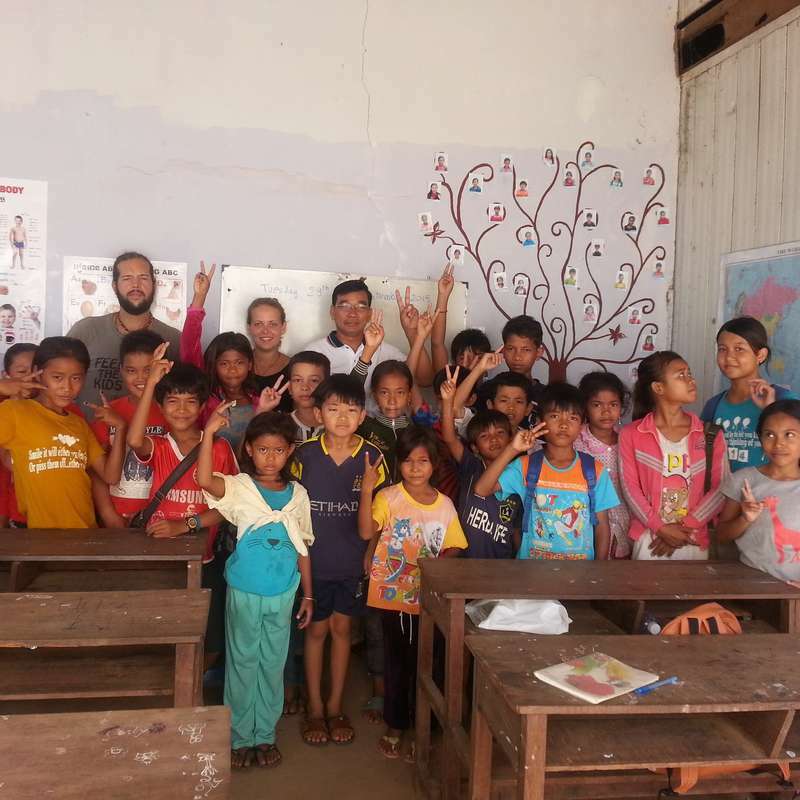 in Kratie, Cambodia teaching basic English to the kids from around the… read more community. Thanks again Rith for the opportunity. Angelika was a very lovely person and her work with the children was absolutly great, she supported our project with all she had, we are so grateful for that, thank you very much for your support. We are looking forward for your next time here and really appreciated your work. We wish you the best and see you hopefully next year. I'm never going to be able to thank Rith enough for giving me the opportunity of volunteering and being part of his project. The experience was amazing and very rewarding, the food was great, and the kids extremely lovable! If you're thinking about volunteering somewhere in Cambodia this is the place to be; aside from spending time with the kids… read more there will be a lot of touring which is guided by Rith. Thank you Rith and I'll make sure I'm back some day! Thank you and Rith and his family loved having you here teaching the kids of Cambodia! The look forward to seeing you next year and they really appreciate your time and devotion to the project. Rith and his family are amazing, strong people that choose to devote their life to children less fortunate. The accommodation, food, attitude and help were great with such little resources. Would love to go back next year, a very deserving project that needs generous people to help.